DR SHE BLOGGO: The RBI Report: "The Sue Sylvester Bowl Shuffle"
Welcome back, guys! Glee has finally returned to our TV screens after a very long hiatus - and with a lot of fanfare. Of course, what with the show having the post-Super Bowl slot, I was bracing myself for an immediate display of something heterosexual males would like. And lo! In the first thirty seconds: there were scantily-clad cheerleaders, BMX bikes, and fire! Let's hope some of the Super Bowl viewers stuck around for the spectacle, eh? To the RBI Report! "The Sue Sylvester Bowl Shuffle," written by Ian Brennan, directed by Brad Falchuk. As a natural extension of the post-Super Bowl eye-catching, the episode also featured the McKinley High football team, and the inherent friction that comes with co-existing alongside Glee Club. In an effort to assuage the tension between football and Glee, Coach Beiste and Mr. Schue (in a lovely extension of their friendship) forced the two teams to combine and perform the halftime number together. Let's look at the three main characters who were focused on this evening: Finn, Quinn, and Karofsky. Their inclusion in this is pretty straightforward. Finn and Quinn are the "leaders" of the original Glee-resistant popular kids, and Karofsky is heading up the Next Generation, if you will. And so the show presents them with... the Choice. They can choose football/cheerleading, or they can choose Glee. Now, inherently, Puck, Mike, Sam, Santana, and Brittany get lumped in with these three. Technically, they have these choices too. But the show cares more about Finn and Quinn because they are portrayed as the leaders of their little units and so we know nothing about why the others choose the way they do. And that's what's frustrating about this whole choosing business - all of the kids have chosen Glee at one point or another. I ranted for a whole week about how the writers needed to cool it with presenting the decision between football and Glee to Finn, only to have him fail at first. The good news about this episode is that Finn passed. The bad news is that Quinn, Santana, and Brittany didn't - and got the treatment usually reserved for Mr. Hudson himself. Of course, the Cheerios had to choose between Glee and cheerleading, because, naturally, Sue Sylvester is making them. Understandable. I do take issue with how the show chose to portray the decision-making, though. We got that great scene in the bathroom where Quinn, Santana, and Brittany deliberate a little bit - which was fantastic because a) it was giving us a glimpse into their brains, and b) it gave us actual evidence of the Unholy Trinity operating as something of a unit again. It was like a zombie double rainbow! My conclusion from this scene was, "Oh, surely they'll stick with Glee! Glee was there for Quinn when no one else was! Glee is the best part of Santana's day! Brittany loves to dance!" Imagine my consternation when the outcome was actually the opposite. Grumble. Yes, being on the Cheerios makes you cool, but by having those ladies choose the Cheerios, the writers were blatantly ignoring some serious canonical evidence that would suggest they might choose otherwise - much like Finn in previous episodes. And that's unfair to the character(s). And what's worse, to me, is how the writers decided to include Finn himself in this little charade: he's the one that saves the day. He waltzes up to the erstwhile Cheerio-Glee hybrids and with only the power of his good-natured persuasion, convinces them to change their minds. You know who should have made those decisions? Quinn, Santana, and Brittany. Their characters would be so much stronger for it. And having Finn tsk-tsk them just makes him look like a hypocrite for having gotten all preachy about a mistake he's made before - and more than once. To me, this was the biggest failing of the episode, and what's worse, it seems as though it were included simply to pave the way for a Finn/Quinn reunion, somewhat ineffectively. I would have been fine with a Fuinn reunion if they didn't destroy a bunch of characterization along the way - and look, Quinn's getting all uncharacteristically swoony because the writers are misusing Finn, who in turn gets his own de-characterization as a result. Oh, show. It's times like these when I see right through you and I do not like what I'm looking at. That being said - much of the rest of the episode was rather successful. I don't wish to seem complainy. 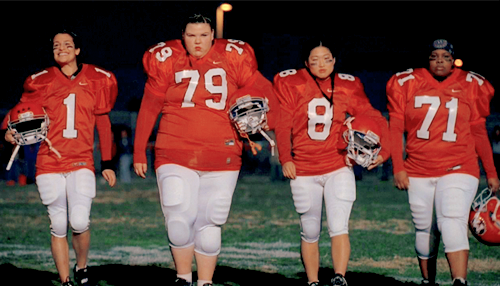 How much did I love the Glee ladies playing football? A+ choice on the slow-mo walk-up, Mr. Falchuk. And, A++ for giving Tina the chance to run with the ball. I wanted so badly for the girls to actually play, and I loved that it was Tina who went for it. That was excellent, but then nerve-wracking because then they went all serious and made me think she'd gotten hurt, which is NOT COOL. But that may just be the after effects of my poor heart having to see the look on Mike's face in that scene. I can't decide if I love or hate the writers for being so damn emotionally manipulative there. What else? I loved to see that Rachel, Kurt, Mercedes, and Blaine are spending time together outside of school. "Need You Now" was beautiful and lovely, and how much do I love that Coach Beiste teared up and sang along? Puck was a solid A+ this episode, between going after Azimio with his guitar, patching things up with Finn, and his rather kickass speech to the football team at half time. He will Tik-Tok your face! And how hilarious was Rachel Berry this episode? Her pure enthusiasm for helping the football team, combined with her refusal to work with homophobes, topped by her flat-out aggression in a brawl/football situation - Ms. Berry was on pointe, I must say. And, the obligatory comment - "Thriller/Heads Will Roll" was indeed pretty awesome, and the sooner we can get Kevin's and Naya's voices actually overlapping, the happier I will be! Barring the Cheerios, Finn had some pretty solid interactions with other classmates - Puck and Karofsky in particular. I like to see the Puck-Finn breakdown mend itself, even if the rift never really went anywhere after "Sectionals," because, hey, I'm never going to say no to friendship on this show. And, I'm finding this Finn-Karofsky dynamic interesting because surely (so then, hopefully) it will come into play when the Kurt-Karofsky business comes to a head. Karofsky was making such lovely progress this episode, and then he got all freaked out again. Sigh. Looking forward to more development with him. The dramatic irony of knowing his secret really does add an extra interesting layer to almost every action he takes onscreen, and I'm definitely intrigued to see where the writers are taking him. Let's talk about Dalton for a bit. So, the Warblers... sang? Yeah, that's pretty much all those guys do, isn't it? I took note of two things in this mostly useless (but still fun) scene - firstly, that Kurt got hardly any coverage in the shots, which makes me wonder if it was purposeful. He's finally blended in there! He's just another one of the backup singers, which tugs at my heart a little bit. Secondly, why isn't there any conflict at Dalton? I know that the showrunners want to portray it as this very ideal place of learning for Kurt, but I personally think that Dalton could stand to have a wee bit of conflict in their halls. And there's some already available, which I literally just mentioned - their whole glee club is just a cappella singers backing up Blaine on the lead. Wouldn't that breed some resentment? I get that RIB want to show off Darren and have some (pretty kickass) a cappella numbers, but... within the show, I want a little bit of conflict there. It could be interesting, and I think it would be pretty realistic. But hey, that's a minor quibble. I should probably speak as well about Sue Sylvester's rampage for "catastrophic success" and how the show frames it within its narrative, but I fear this is getting too long - so, it'll be a post for another day. Go figure that I write two epic posts about Finn and Quinn over the hiatus, and who should take center stage in the first episode back? It's why this recap is filled with my reactions to those parts - I'm hyper-aware to how the writers deliver Finn and Quinn's characterization, and unfortunately, in this episode, it was slightly left of target. But anyways, I stumbled upon your blog after reading some of your posts on Finn's characterization at GleeForum.com. I really thought I was one of the few fans who cared about Glee's decaying characterizations and sloppy writing. But after reading your posts, I'm so happy to know there are fans who don't want to just mindlessly watch Glee, but want to seriously improve the show's quality to the best of your ability. It's also nice to read about a female fan who ISN'T obsessed with shipping. Seriously, major props to ya! ^_^ I look forward to the rest of your RIB report cards! Shelby - thanks so much! I love Glee dearly, but I think it has a lot of potential to be better than it is if the writers just re-focused on good storytelling. It's always nice to know that others feel this way too, hopefully the writers will realize that there is a large portion of their fanbase who want a well-crafted television show more than their ship on the TV. I think I've visited TVtropes.com once but I haven't been there in awhile. "Save the Cat" I picked up in a bookstore once and definitely wanted to add it to my wishlist, but I still haven't gotten it yet. I love reading about storytelling structure and the "how" of writing. Thanks again for the read and the comment - hope tomorrow's episode is a good one! Here Here about wanting a well crafted show. Overall I really loved the episode, though I agree Glee has a writers problem. Frustrating thing is they are close to a great show. I think the writers only hear the internet noise and bow to it way too often. Not picking on these shippers, but the #reuniteFinchel twitter campaign is basically those fans saying put our couple together regardless if you have a plan or not or it makes sense in the plot or not. IMO, a very short sighted view on show or characters that you like. I would rather have my couple developed separately than be marginalized together, which happened to them in the first 10 episodes this season. It feels like the show is trying to do Comedy, Music, and drama at the same time and as a result do none of them well too many times. In regards to the newest Quinn/Finn conflict with popularity over Glee, I at least though it was done well this time unlike before. Quinn acknowledged what Glee had done for her and you could see the conflict in her, regardless of how long it took her to get there in the end. At least Finn showed leadership, I'll take this Finn over the first 10 episodes of Finn from this season any day. Anonymous - I definitely agree about the writers listening too much to the "internet noise." I looked at Brad Falchuk's twitter mentions and almost everything he is being tweeted is about shipping. It saddened me a little, and in some ways I can't blame the writers for bowing to the pressure. The pressure's pretty intense. I will say I think I wasn't positive enough in my review of "The Sue Sylvester Bowl Shuffle" - I think most of the characters and character interactions were on pointe. I just couldn't get past how they handled the Cheerio storyline. I agree that Finn himself was great this episode, I just have an issue with how the writers used him at the expense of Quinn, Brittany, and Santana making their decision. But overall this was a pretty great episode, otherwise. I wish I had an account to comment with because I hate anonymous commenting, but I felt compelled anyway. I found your blog through someone else who linked me to the character analysis of Finn. I loved reading intelligent and thoughtful writing about Glee and I would really like to see more. I know it is probably strange to see a request on your personal blog, but I would truly enjoy reading a similar piece breaking down Finn and Quinn's relationship if you ever have the time or motivation to do so. I absolutely love the way you write and that is a subject I have been pondering for a while, especially since Silly Love Songs. I am torn between the notion that it is an accurate representation of high school romance, or a poorly written instant of character regression to ease the producer's boredom. Anonymous - No worries about anon-commenting! I always love feedback, so don't let not having an account stop you. Thank you so much for you kind words. I didn't really intend for this blog to be about breaking down the characters of Glee, but it just kind of happened that way, and honestly, I'm more than happy to play to that strength. I think there's a large portion of Glee's fans who really love the show but get frustrated with it when it's not reaching its full potential. I'm definitely one of those people, and it's lovely to see that there are others out there who share the same standpoint. I'm not sure if you have a Tumblr, but if you do, I tend to write more random and a little less official Glee thinky-thoughts over there. I've actually written two things about Finn and Quinn's dynamic lately because it has been vexing me as well. The first I wrote before the Super Bowl episode aired - it addresses the issue of many fans "taking sides" in the F/Q breakdown. (I feel like most fans either side with Finn or with Quinn based on their early actions and tend to lash out at the opposition, haha.) And the second, I wrote after "Silly Love Songs" - about how the F/Q reunion should be really great, but it's just not quite palatable because of how it's being done. Maybe they'll be of interest? Even if you don't have a Tumblr account, you can <a href="http://drshebloggo.tumblr.com/ask>leave me a message</a> there and I'm sure we can drum up some good discussion.